can the handle be an oval shape? Make the birthday guy or gal turn their frown upside down with brown! 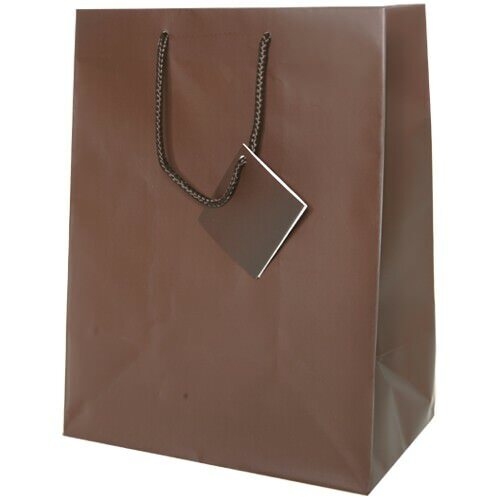 These Brown Gift Bags are as unique as it gets, so when your recipient hasn't had the best birthday, put this in front of them and they are sure to smile wide. With our range of sizes, you'll be able to fit a ton of items inside. From our extra small for those tiny party favors to our extra extra extra large for those big toys, we have it all. We even carry a set of wine bags! And as you look through the selection, you'll find that we carry a variety of textures and finishes. From matte to glossy, from kraft to burlap, the possibilities are endless. We even carry alligator textures for you sophisticated folk out there. The best part about a gift bag like this one is the ease of wrapping. There is none! Just add some tissue paper, and your recipient’s frown will automatically turn into a smile.